Writers: Jesse Baget, Richard Schenkman and Eric D. Wilkinson. Cast: Ian Bamberg, Noell Coet, Adam C. Edwards, Stephanie Erb and Daniel Hugh Kelly. Director Richard Schenkman's name has come up a couple times this week on 28DLA. Schenkman is the writer behind another horror film titled Zombie Night (2013). His latest feature film from behind the camera is titled Mischief Night. 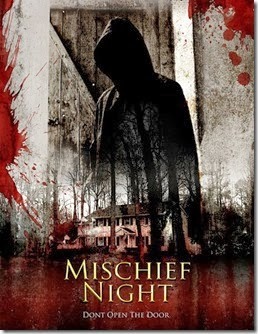 This title was released on a few home entertainment formats on Mischief Night, October 30th, 2013. Sometimes called "Gate Night" or "Devil's Night," the night before Halloween is a time for pranks and misdeeds. In this film, Mischief Night is a time for murder! Unfortunately, in this film, the villains appear very silly, which weakens the conflict. The protagonist, on the other hand, is compelling and developed well, thanks to an interesting character arc. Though, Mischief Night offers the barest of thrills. The story for the film focuses on Emily (Noell Coet). She is blind due to a tragic car accident. However, she is not physically blind and her ailment is caused psychosomatically (an act of repression). Emily still leads a mostly normal life. When she is left alone on Mischief Night, the usual pranksters come calling and so do a few killers. 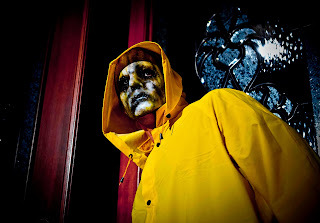 These masked men wear yellow raincoats, which makes them look like those plastic ducks you had in the bath as a kid. Very unthreatening, these axe murderers stalk Emily throughout her house just for kicks. It would have been more fun to see a lot more gore in this very small indie slasher feature. An excellent performance by Noell Coet. The antagonists within Mischief Night are the film's weakest element. They are not set up in any way shape or form. They are simply flat characters, which feebly force an uncompelling confrontation. The villains are also unimposing. Their small frames would not create much terror in the average victim. As well, the black hats are given only a few lines and their characterizations are uninteresting. Some of the best films in horror actually develop the antagonists; that is not the case here. One of the only reasons to watch this title is for the performance of actress Noell Coet and the character Emily. Developed early, this character has a few challenges to overcome. She has lost her mother in a tragic car accident and she is trying to conquer her blindness through therapy. Emily is caring and Coet brings a subdued charm to this character. Also, this character is believable in the film. Her reactions to a home invasion and a dire cicumstance are appropriate. As well, the arc for Emily is brought out over time and setup well, which allows the viewer to empathize with the protagonist, on a couple of levels. The film's heroine is well developed and created with some care. The imbalance between the protagonist and antagonist does not create a very strong conflict. A script's attention is generally served when placed mostly on the central character. However, the best films develop a strong villain, in which it is uncertain whether the hero or heroine can overcome them, or the challenge they present. The villains in this film are not given such suitable attention. And thus, Mischief Night struggles to create tension, thrills and even any real excitement. Emily falls asleep during the film's climax and this viewer almost did the same. There is not enough tension and sparks here for the film to be recommended to most film fans. Mischief Night is a small indie slasher, which has a few compelling film elements, such as: lighting, music and tone. However, the film's central conflict is not setup well enough to create any real action. The protagonist overcomes a series of obstacles, but the ending feels flat. Mischief Night might satisfy a few indie horror fans, but the majority might want to seek out better slasher films like the Maniac remake (2013) and Evidence (2013). This film, like the villains, is shortly forgotten. Overall: 6.25 out of 10 (looks well shot, good use of darkness, the killer costumes were a poor choice, only a few characters and one major setting, a smallish film).